The craft of block making came to Rajasthan along with printers from Sind-Punjab. Most of the block makers in Rajasthan are Muslims. The basic carving tools are made by block makers themselves form iron rods, bicycle spokes etc. The ‘design” is first drawn on paper and stretched out on smooth surface of wood. The motif or design is then pierced through the needles so that the “impression” is transferred on the smooth surface of wood, later the unwanted areas are carved out. Iron nails and woolen-felt are also used to improve the quality of impression. 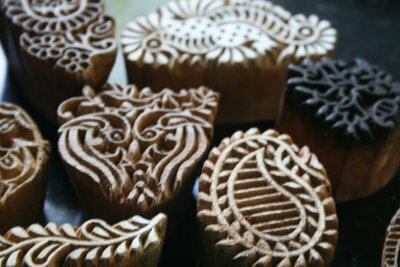 Wooden block can be classified in three types viz Rekh’- the outline block, “gudh”- the background block, and “Datta’- the filling block. Gudh’: The block which covers the background of patterns in called gudh. Gudh is sometimes treated as the key block and printed first. ‘Datta’: All blocks other than over above mentioned two become ‘dattas’ or filling blocks. The handle: Once the block is carved, a handle, usually of cheaper wood, is nailed to the block to help the printer in registering the impression with the block comfortable. The handle is a very important part of block making, as it is this part which helps to trace the family who carved the block. One has only to look at the handle to identify the block maker as each family uses special effect in block handle. Some carve the handle out of the same piece of wood on which the design is carved and some shape the handle in a peculiar way. Traditionally printing tables were of 2 feet wide and 3 feet in length and 1foot high above the ground. These are known as‘patias’. Now-a-days bigger table 5 feet wide, 6 meters long and 4 feet high are used for faster production. Women and old printers prefer the traditional ‘patia’ for printing. 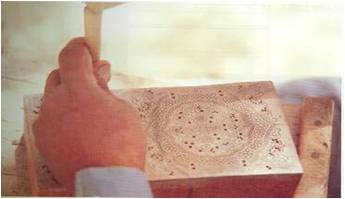 The printing table are covered with 22 to 26 layers of Hessian cloth and finally covered with three-four layers of old fabric known as ‘acharas’. These ‘acharas’ are changed every time a fresh cloth is laid for printing. For better quality of workmanship the printers have two separate tables for printing black and red colors. 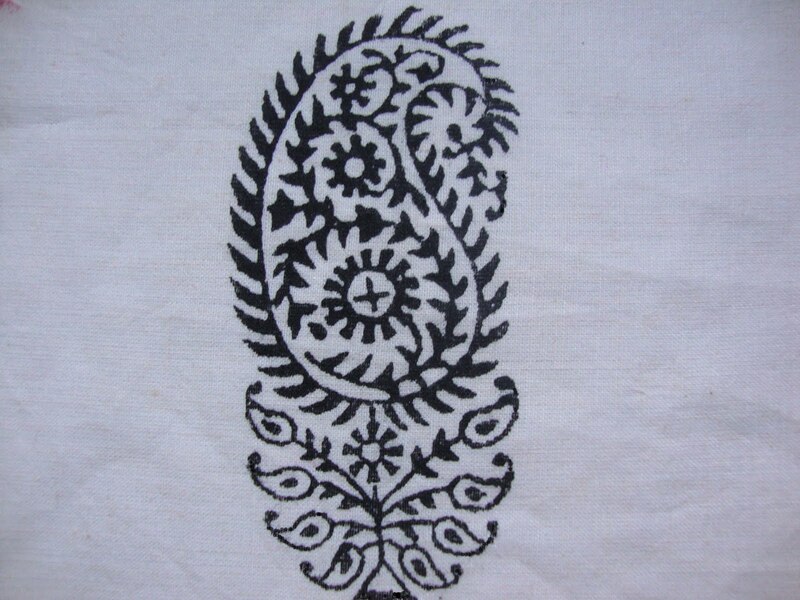 © 2009 rajasthantextiles.com. | Photos by prerna | Design by anam.